Kuwait – Kuwait voters turned out in large numbers at the poll stations to elect new representatives for the National Assembly, the 15th since Kuwait’s independence in 1961. Kuwaiti sources told Asharq Al-Awsat newspaper that the turnout was between 69% and 72% compared to 2013, where it was 51.9%. Political observers attributed the huge participation among both genders to two main reasons. They believe that economic challenges and the expected laws to be passed drove citizens to elect for their representatives. The second reason is the return of the abstainers who sat out in 2013 elections. Kuwaiti political analysts believe that the return of opposition is the reason for the huge turnout. Resources close to the regime believe that brings back the national unity and unites all parties in the National Assembly. The current government, led by Sheikh Jaber Mubarak al-Hamad al-Subah, is expected to resign on Monday. Turnout was high with some polling stations reporting that 80 percent of eligible voters had cast their ballots by the time polls closed, state-run Kuwait Television reported. The elections witnessed huge participation of the elderly since the government provided wheel chairs and transportation. A voter was sick, and used an ambulance to take him on his hospital bed to the polling station to cast his vote. Friday was electoral silence day, one day before the actual elections day. The law provides that the media, even electronic media, is not allowed to practice any activities regarding the candidates’ electoral campaigns. Nominees themselves will have to bring their campaigning to a complete halt. Anyone, including the media, caught breaking the mandated silence will be subject to a KD 5,000 fine. Pre-election silence aims to give voters a chance to carefully consider their choice for the election day. The media can only offer messages to educate the voters on elections, or urge them to positively take part in the vote. According to the Ministry of Information’s relevant decree, broadcasting, re-broadcasting or publishing any interviews, programs or reports with candidates for the National Assembly elections or the Municipal Council, is prohibited on the polling day, and the day before it. Asharq al-Awsat newspaper toured the polling stations in some schools and saw candidates among their supporters. They were in their designated tents with their pictures hung inside and with food everywhere. It was like a celebration. According to Kuwaiti law, candidates are allowed to enter the polls stations. Former Speaker Marzouk al-Ghanem told the press that Kuwait is facing many challenges that should be addressed. Meanwhile, Ministry of Interior warned voters not to take photos of the ballots after casting their votes, saying this is prohibited by the election law. According to the law, a violator can spend five years behind bars, and pay a fine of KD 5,000, the ministry’s statement added. Article 44 of Kuwait’s Election Law provides for punishing violators in the case of using force or threatening to prevent voters from practicing their rights, or to vote for certain candidates, or refraining from balloting. The same article provides for a penalty in case of vote buying, promoting false news about a candidate’s behavior among voters, or going to the polling station with a device with the intention of taking photos of ballots to prove one has voted for a certain nominee. Also, one will be punished if he goes to the polling centers carrying a fire arm, according to Article 30 of the law. Kuwait- Authorities in Kuwait are tracking down details extracted from an arrested group of residents suspected of plotting and leading terror attacks against U.S. soldiers assigned to the country. A collision between a truck driven by an Egyptian and a vehicle carrying three U.S. soldiers in Kuwait was a “terrorist attack,” not an accident as first thought, the U.S. embassy said. “U.S. Embassy in Kuwait confirms that what at first appeared to be a routine traffic accident involving three deployed U.S. military personnel… was in fact an attempted terrorist attack,” the mission said in a statement posted on its website. The statement said the attack took place on Thursday and that the U.S. soldiers escaped unhurt. The soldiers also rescued the Egyptian driver when his truck caught fire, it said. The Kuwaiti interior ministry said on Saturday that authorities arrested the Egyptian driver and found with him a hand-written note in which he had pledged allegiance to ISIS. It also said that the driver, identified as Ibrahim Sulaiman, 28, also carried a belt and material suspected of being explosives. Sulaiman told investigators that he supported the group and believed that its leader Abu Bakr Al Baghdadi should be the head of all Muslims. Sulaiman said that his attempts to learn how to make an explosive belt from the internet had failed as he did not have the required items. Kuwaiti authorities announced in July they had dismantled three ISIS cells plotting attacks, including a suicide bombing against a Shi’ite mosque and against an interior ministry target. An ISIS-linked suicide bomber had killed 26 worshippers in June last year when he blew himself up in a mosque. The U.S. embassy said it was not aware of specific, credible threats against private U.S. citizens in Kuwait at this time. But it warned that the attack serves as a reminder to maintain a high level of attentiveness, advising U.S. citizens to review their personal security plans and remain alert. Kuwait yesterday reiterated its vision to have a nuclear weapon free Middle East. The Gulf state’s foreign ministry representative, Talal Al-Fasam, called for the International Atomic Energy Agency (IAEA) to apply its mandate to implement nuclear safeguards in the region. He made his comments at the 60th General Conference of the agency. Al-Fasam also addressed the Israeli standpoint on non-proliferation. He asserted that Israel must sign the Non-Proliferation Treaty. The Kuwaiti official noted that that all countries in the region are signatories to and abide by the treaty while Israel persists in its refusal to do so. Indeed, he pointed out, Israel even refuses to open its nuclear installations to IAEA inspectors. – If BDS compels G4S to follow through with its announcement by ending all forms of complicity in Israel’s violations of international law, G4S would become the fourth multinational to abandon the Israeli market, in less than a year, due to heavy losses and/or reputational risk. – In September 2015, French corporate giant Veolia set the trend by selling off all of its businesses in Israel after losing tenders and contracts worth billions of dollars following a seven-year BDS campaign against its role in illegal Israeli settlement projects. – Irish building materials corporation CRH has more recently exited the Israeli market, selling off its 25% stake in the Israeli occupation-profiteer Nesher Cement. – French telecommunications giant Orange announced earlier this year the termination of its franchise relationship with Israeli Partner Communications, after intense BDS pressure in France and Egypt. – In a related major development, the $20-billion pension fund of the United Methodist Churchdeclared in January 2016 the five largest Israeli banks off limits for investment and divested from the two that it held in its portfolios. – The Israel Export Institute has revealed that Israel’s exports in 2015 have dropped by 7% over 2014. – Foreign direct investment in Israel dropped by 46% in 2014 as compared to 2013, according to a UN report. One of the report’s authors admitted that BDS played a key role in this sharp drop. – In addition to abandoning its Israeli contracts, G4S announced in March it was selling its mass incarceration businesses that operate youth detention centers in the UK and the US. It is accused by campaigners of involvement in racist and abusive practices. CAIRO: President Abdel Fatah al-Sisi met with Kuwaiti Justice Minister Yacoub Al Sanea to discuss counter-terrorism efforts that will be on the agenda of the Justice Arab Ministers meeting facilitated by the Arab League Wednesday, the Presidential office said in a statement. “President Sisi stressed the necessity of enhancing judiciary cooperation to face the current challenges and organized crimes that face the Arab nation,” the statement said. Both sides tackled the necessity of combating the terrorists who use online sites and social media for disseminating their extremist ideologies, the statement continued. President Sisi had paid Kuwait a one-day visit to enhance bilateral relations. In March 2015, Kuwait pledged $4 billion dollars in investments to Egyptian, followed by an $8B pledge by Saudi Arabia and UAE during the Sharm el-Sheikh Economic Development Conference. Kuwait is one of the Gulf States that supported the mass protests which called for the end of the former President Mohamed Morsi’s regime. Between July 2013, when Morsi was removed from office, and January 2015 Kuwait granted Egypt $4 billion in aid. Kuwait will send ground troops to Saudi Arabia as part of their involvement in the ground offensive in Yemen against the Ansarullah rebels, known as Houthis, a local newspaper reported Tuesday citing an unnamed government source. Sending the troops was approved by the country’s cabinet and will be sent to Saudi Arabia as early as next week. No information was provided about the size of the force. Kuwait is part of the Saudi-led coalition in Yemen which kicked off late March and involves more than 10 Saudi regional allies. However, Kuwait has only been providing air support and if the report is true, Kuwait would become the latest country to provide ground troops to the coalition alongside the United Arab Emirates, Qatar, Bahrain and Sudan. Saudi Arabia launched the operation in a bid to reinstate their Yemeni ally, exiled President Abd-Rabbu Mansour Hadi,l after the rebels took control of the capital Sanaa and other parts of the country ousting the Saudi-backed government and forcing Hadi to flee to Riyadh. The Islamic State in Iraq and Syria (ISIS) has claimed responsibility for the bloody explosion that rocked a Shia mosque in Kuwait’s capital. The fatal attack took place during Friday’s prayers at the Shiite-affiliated Imam Al-Sadeq mosque, killing at least 27 people and wounding 227 others. A group calling itself “Najd Province” [believed to be affiliated with ISIS]claimed responsibility of the attack. The same group said it had carried out two bombing attacks on Shi mosques in Saudi Arabi late on May where more than two dozen were killed. A statement posted by pro-ISIS social media accounts boasted the offensive against what they called ‘Temple of the Rejectionists”, a derogatory term used by the extremist Sunni group to describe Shia Muslims. The perpetrator of the massacre was identified as Abu Suleiman Al-Muwahed. “The worshippers were on Sujood [kneeling]when the suicide bomber walked in the detonated his explosive belt. He looked in his 20s, I saw him with my own eyes”, said MP Khalil Al-Salih who happened to be at the Imam Sadiq mosque during the attack. That a suicide bomber blows himself up among a congregation of worshippers during Friday prayers in the Holy month of Ramadan has been denounced by the majority of Muslims worldwide. Immediately after the fatal blast, Kuwaiti Emir Sheikh Sabah Al-Ahmad Al-Jaber Al-Sabah visited the damaged mosque, along with the speaker of Kuwaiti parliament who called the cabinet for an urgent meeting. The cabinet declared Saturday an official day of mourning for the victims. The government of Kuwait has announced that it will not deal with 50 companies due to their role in illegal Israeli settlements in the occupied Palestinian territory in a move being welcomed by campaigners as a landmark success for the Boycott, Divestment and Sanctions (BDS) movement. The blacklisted companies include some of the top corporate targets of the BDS movement, such as Volvo, Heidelberg Cement, Dexia, Pizzarotti, Alstom as well as Veolia. Veolia was recently excluded from a $750m contract, and “all future contracts,” by Kuwaiti authorities over its role in the illegal Jerusalem Light Rail project and other projects that serve illegal Israeli settlements. The blacklisted companies are expected to be excluded from contracts worth billions of dollars, especially if other Arab countries take similar steps. According to media reports, the Kuwaiti Ministry of Commerce and Industry is also investigating the Kuwaiti operations of G4S, the British security company that secures Israeli military checkpoints and colonies and helps Israel run prisons at which Palestinian political prisoners are tortured, with a view to cancelling its license to operate if it does not terminate its participation in Israeli violations of international law. “This landmark decision means that international companies will now pay an even heavier price for participating in Israeli violations of international law. “As European banks and pension funds continue to divest from Israel’s occupation and companies such as Veolia and G4S lose billions of dollars as a result of sustained, effective grassroots campaigning, many firms will now be wondering whether supporting Israel’s regime of occupation, colonialism and apartheid is good for business,” said Shuaibi. Many European governments have taken steps to discourage firms from having economic links to the Israeli occupation of Gaza and the West Bank, including East Jerusalem, but this is the first time a government has decided to boycott international companies over their role in illegal Israeli settlements. The Arab Summit of 2006 in Khartoum unanimously called for punitive measures against the companies, including Veolia and Alstom, involved in Israel’s colonization of Jerusalem. 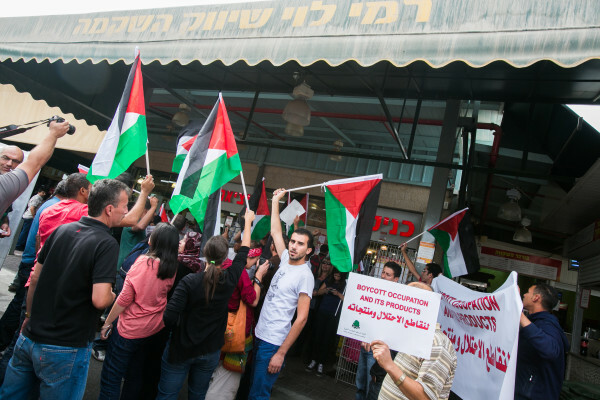 The BNC has been working closely with BDS Kuwait since 2010 on advocating for accountability measures against international corporations that are complicit in Israel’s violations of international law and Palestinian rights. “In the wake of Israel’s massacre in Gaza, which was only made possible with the support of international governments and companies, we urge all governments, especially Arab League and OIC members, to impose sanctions on Israel and take action against the complicit corporations that profit from Israel’s occupation and crimes,” added Barghouti. International companies that participate in Israel’s violations of international law have faced increasing pressure as a result of BDS campaigning in recent years. Veolia recently announced that it intends to sell off large parts of its business in Israel after boycott campaigns cost the company more than $23bn – not counting Veolia’s latest losses in Kuwait — in lost potential contracts, although the French multinational will still remain involved in the illegal Jerusalem Light Rail Project. British security giant G4S has pledged to end some aspects of its involvement in torture-ridden Israel’s prison system and checkpoints after trade unions, NGOs, universities and other public bodies cancelled contracts with the company. The Presbyterian Church (USA) voted in June to divest from Caterpillar, Motorola Solutions, and Hewlett Packard over their role in Israel’s occupation of Palestinian territory. In January, Dutch pension giant PGGM announced it was divesting from five Israeli banks due to their support for illegal Israeli settlements. In February, it emerged that the sovereign fund of Luxembourg had taken a similar step, excluding nine Israeli banks and firms from its portfolio. In the months that followed, banks and pension funds in Norway, the Netherlands, the US and Denmark made similar announcements. According to reliable sources in Kuwait, following this humiliating defeat, Veolia was compelled to withdraw from a tender for a project to expand the “Um Al-Haiman” waste water treatment station after qualifying for it. The project is valued at about $1.5 billion. Even before this total loss of contracts worth $2.25B, Veolia had already lost or had to pull out of tenders worth approximately $24 billion, mainly in the UK, Sweden, Ireland and the U.S.
Veolia has been forced to admit that the campaign against it is having a major impact and recently announced that it intends to sell off its Israeli water, waste, and energy businesses, having already sold off its share in companies that operate bus lines through illegal Israeli settlements. 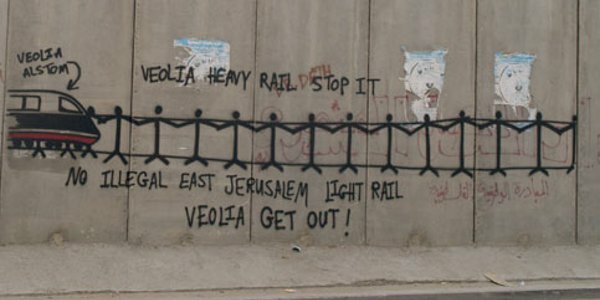 The campaign against Veolia shall continue until it ends all aspects of its participation in Israeli violations of international law, including by withdrawing from the Jerusalem Light Rail and the Tovlan landfill, two infrastructure projects for illegal Israeli settlements. The BNC appealed a few months ago to Kuwait’s Government and parliament to exclude Veolia because of its involvement in a number of Israeli projects that blatantly violate international law and the Palestinian human rights, including the “Jerusalem Light Rail” that connects the illegal settlements in and around occupied Jerusalem with the city. 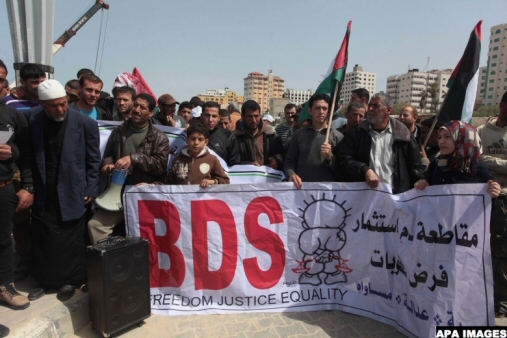 This latest BDS victory against Veolia in Kuwait is seen by observers as “the tip of the BDS iceberg” in the Arab world.